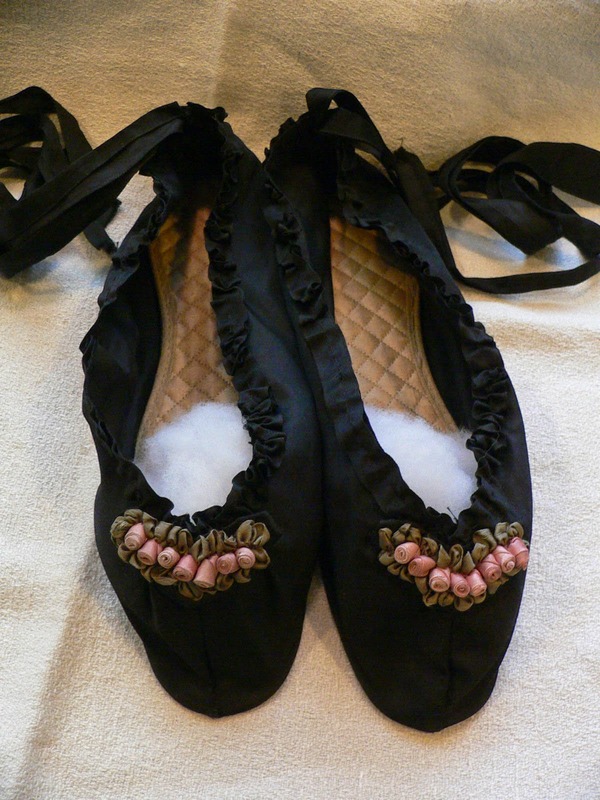 This is a wonderful pair civil war era slippers most likely for dancing. 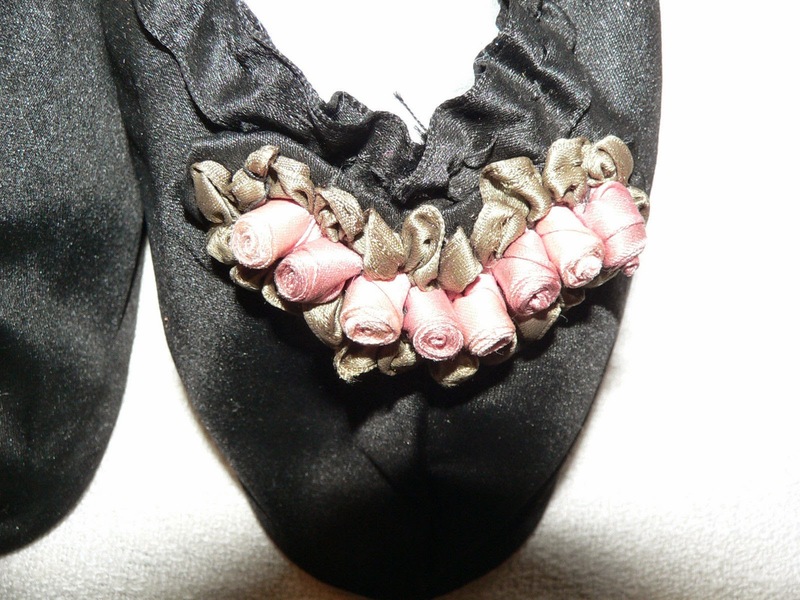 They are made of black silk with a row of tiny pink rosettes with green silk leaves across the top of the toe. The opening has a ruffle all around. 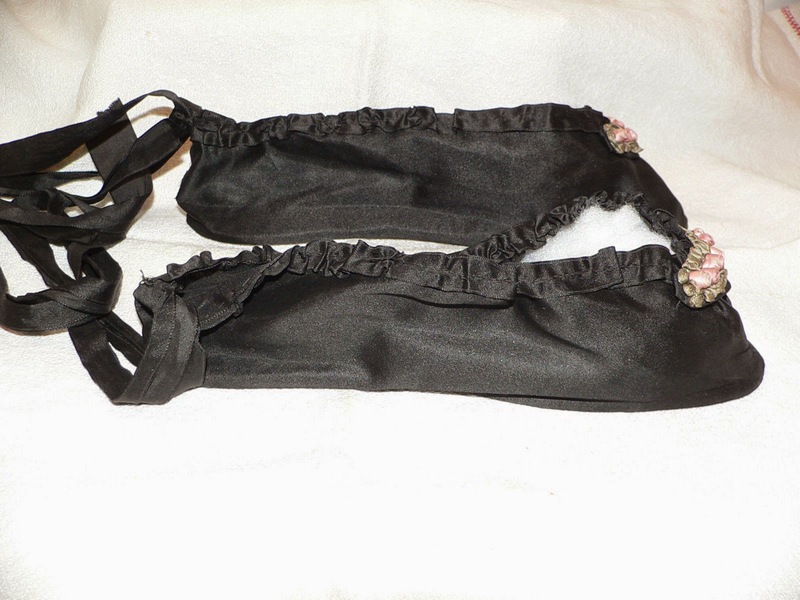 There are 20 - 21 inch ties for lacing at the back. 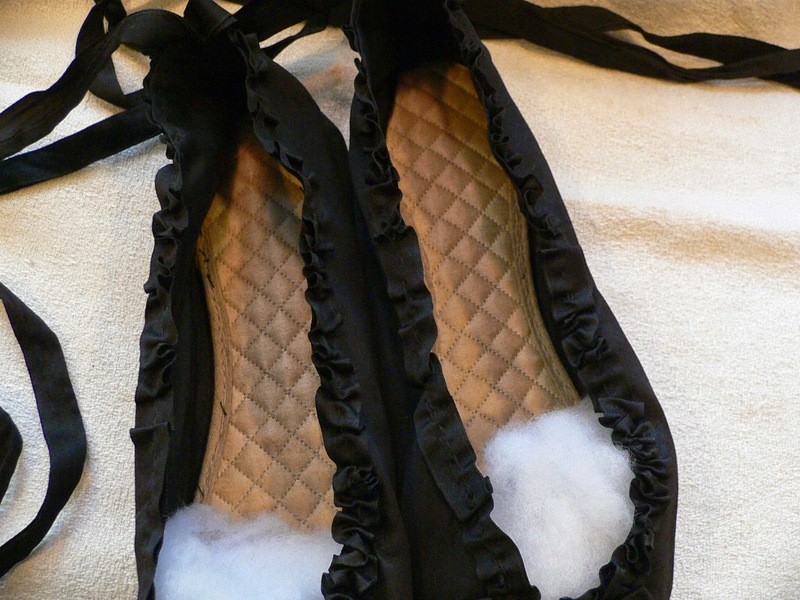 They are not lined except for the inner sole which is lined in quilt fashion of a beige silk. 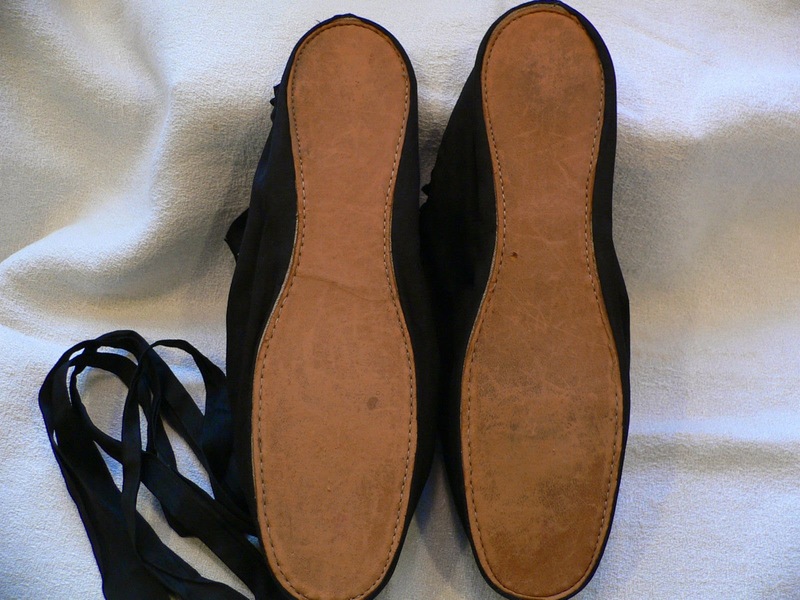 The bottom soles are of a thin tan leather.They measure 9 1/4 inches long and 2 3/8 across at widest. I wear size 8 1/2 and I can get my feet in, they would be better for 7 1/2. They are in excellent condition for such delicately made slippers. First, what sort of.....individual even begins to think that it's okay to try on a pair of antique silk slippers? And then to jam your too big foot into them? Yeah, no. Still have squared off insides to the shoe (the upper part of the fabric that crosses the toes is a straight edge on the MET pair. 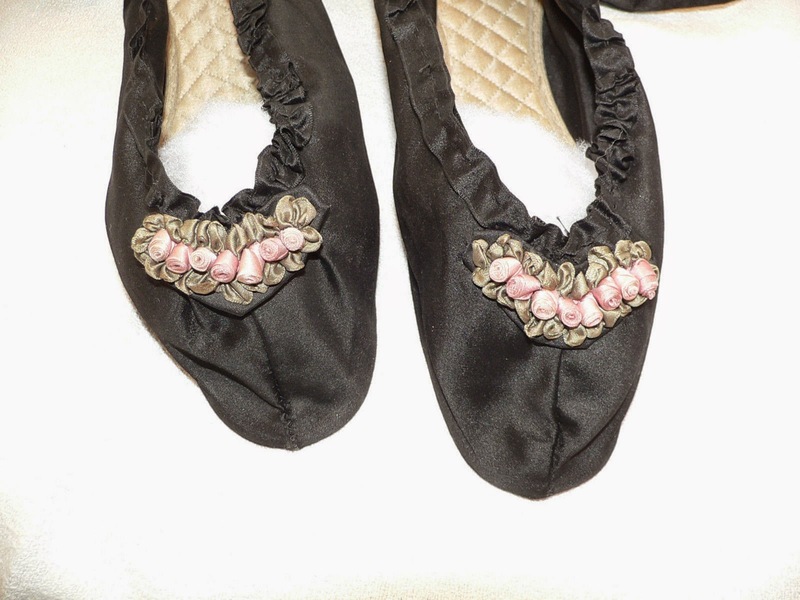 On the black silk extant ones, the fabric across the toes comes in at an angle - more similar to later Japanese and Chinese styles which greatly influenced early 20th Century fashion.) The fabric across the toes also sits higher up on the foot. That's when I started to look at the later fashions. 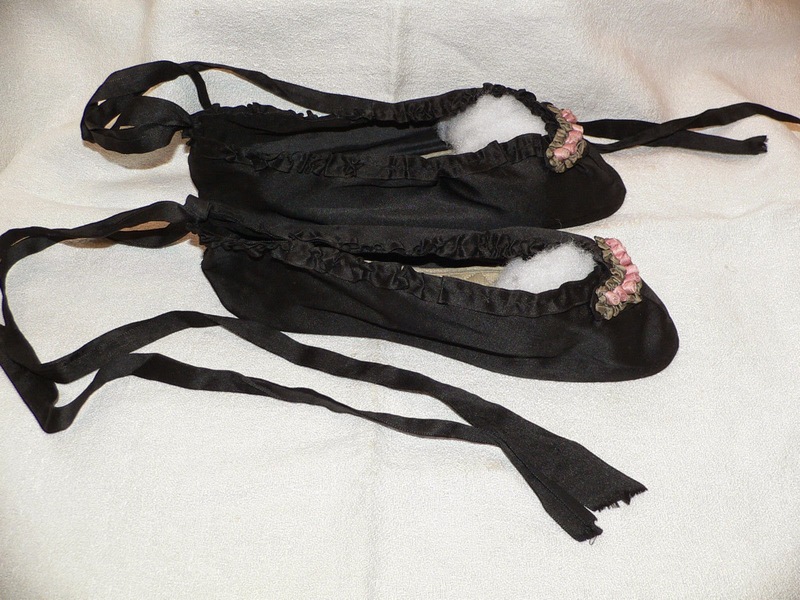 On this page about halfway down, you'll see a collection of extant items to include a pink pair of slippers very similar to the black silk ones here. These items are from the 1920's. There is also this pretty yellow slipper from the 1920's and this pink pair. After looking through a lot of extant slippers and magazines, I'm pretty sure these are 1920's house slippers and not 1860's dancing slippers.